DHAKA, Nov 30 2016 (IPS) - Amid growing persecution by Myanmar’s military, thousands of minority Rohingya Muslims in its western state of Rakhine have fled their frontier villages and are languishing along the Myanmar-Bangladesh border for lack of shelter and emergency supplies. In response to alleged coordinated attacks on three border posts on Oct. 9 that killed nine guards, Myanmar troops swarmed into areas along the country’s frontier with Bangladesh, forcing the Rohingyas to leave their homes. London-based Arakan Rohingya National Organisation (ARNO), a political group based in Rakhine state (Arakan), Myanmar, said on Nov. 28 that Myanmar security forces have killed over 500 people, raped hundreds of women, burned down over 2,500 houses, destroyed mosques and religious schools, and perpetrated other abuses in the latest round of violence. The international community and rights groups, including the United Nations High Commissioner for Refugees (UNHCR), Amnesty International and Human Rights Watch (HRW), have expressed grave concern over the brutalities in Myanmar. They termed the operation the most serious since hundreds were killed in communal clashes in Rakhine in 2012. Up to 250,000 people are said to have been displaced so far and thousands more affected by the recent operation. Both Myanmar’s military and government deny the allegations by the rights groups and the displaced minority. Amid the evolving situation, Bangladesh, a next-door neighbour of Myanmar, is unwilling to allow the entry of more Rohingyas, as it has already been hosting some 300,000 undocumented Rohingyas since 1977. The Bangladesh government says it is not its lone responsibility to give them refuge. In an Nov. 20 interview with United News of Bangladesh (UNB), an independent news agency, director general of Border Guard Bangladesh (BGB) Abul Hossain said Bangladesh would not allow anybody to enter its territory illegally. The Myanmar government has denied them citizenship even though they have been living there for generations, as the Buddhist majority of Rakhine state considers them illegal migrants from Bangladesh. On Nov. 24, Amnesty International said the Rohingya refugees and asylum-seekers have been forced into hiding across the Na’f River that divides Bangladesh and Myanmar, and they are now suffering for lack of food and medical care. Bangladesh’s Home Minister Asaduzzaman Khan said Rohingyas were also entering Bangladesh through remote hilly areas and it was difficult to stem the flow. “We hope that the Myanmar government will come to a solution soon,” Khan said. Meanwhile, UNHCR has appealed to the government of Bangladesh to keep its border with Myanmar open and allow safe passage to any civilians fleeing the violence. According to the Bangladesh Human Rights Commission, some 9,000 Rohingya people have already entered Bangladesh with the help of smugglers who know how to dodge the Bangladesh border guards (BGB). Bangladesh has reinforced both its border and coast guards since the escalation of operation by the Myanmar military and sent back many people. 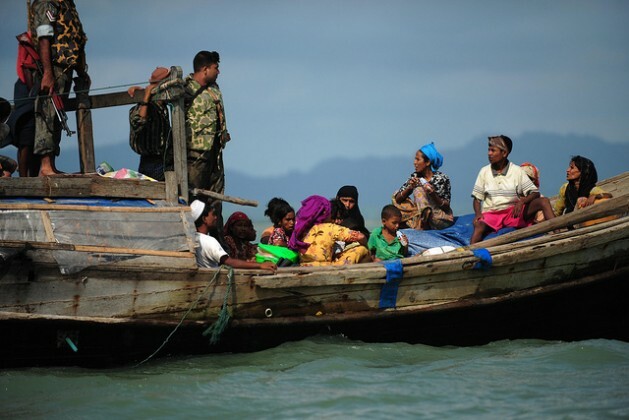 Some 3,000 Rohingyas are also said to have fled to China. Prothom Alo, a leading Bengali national daily, reported that some 1,100 Rohingyas entered Bangladesh on Nov. 28 alone, with Myanmar’s military burning down their houses and firing shots indiscriminately. Amid international pressure to accept the newly displaced Rohingya people, the Foreign Ministry of Bangladesh summoned the Myanmar Ambassador in Dhaka on Nov. 23 and conveyed its deep concern at the military operation forcing Rohingya Muslims to flee their frontier homes. Though the Bangladesh government is unwilling to accept the Rohingyas, the Bangladesh Nationalist Party (BNP), one of Bangladesh’s two major parties, has been urging the government to give shelter to the displaced Rohingya people on humanitarian grounds. Meanwhile, the Amnesty International has denounced the persecution of Rohingya Muslims by Myanmar and also asked Bangladesh not to push the fleeing Rohingyas back across the border. “The Rohingyas are being squeezed by the callous actions of both the Myanmar and Bangladesh authorities. Fleeing collective punishment in Myanmar, they are being pushed back by the Bangladeshi authorities. Trapped between these cruel fates, their desperate need for food, water and medical care is not being addressed,” said Champa Patel, Amnesty International’s South Asia director. In Bangladesh’s capital Dhaka, thousands of people took to the streets on Nov. 25 in protest against the persecution of Rohingya Muslims. The protesters also burned an effigy of Myanmar’s leader Aung San Suu Kyi and a flag of Myanmar, carrying banners that read ‘Open the border to save the Rohingyas’. A vigorous social media campaign is also underway to put pressure on Bangladesh’s authorities to allow the displaced Rohingyas to enter the country. UNICEF has said thousands of malnourished children are suffering from lack of medical care and in danger of starving. Last week, Human Rights Watch released satellite images showing that over 1,000 Rohingya homes have been destroyed in five villages of Rakhine state. The New York-based group in a statement that satellite images taken on Nov. 10, 17 and 18 showed 820 destroyed buildings, bringing the total number it says it has documented to 1,250. As the situation continues to deteriorate, the United States reiterated its call for a full, formal and transparent investigation into violence in Rakhine state and laid emphasis on international community’s participation for finding a solution there. A human rights icon whose activism earned her the Nobel Peace Prize, Suu Kyi is now being criticised globally for her silence over the dire situation in her own country. The first democratic election in 25 years was held in Myanmar in November last year, with Aung San Suu Kyi’s National League for Democracy (NLD) winning it with a thumping majority. Though she could not assume the presidency due to a constitutional bar, Suu Kyi is considered a de-facto leader as she serves as State Counsellor.